There are plenty of reasons why you would choose to exercise your dog indoors and they could be – weather, mobility issues (you and/or your dog), extra activity in addition to walks. It’s important to walk your dog every day, the distance and frequency will obviously be tailored to your dog’s abilities. However, if you absolutely cannot take your dog out due to safety or other concerns, or you just want to add some extra fun to your dog’s life, here’s how to do it! Load your dog into the car and take him for a walk through one of those big pet supply stores, or any other large retailer that allows dogs. Some of them are so big your pup can get a decent workout, especially if you do a few laps! Let him sniff around, make friends with other dogs and get your shopping done at the same time. Sounds like a win/win to me! 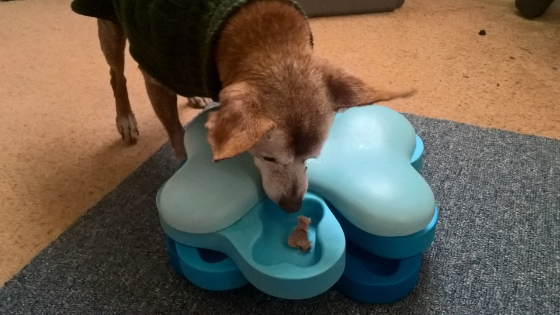 You don’t need a lot of space to set up a challenge for your dog. You may not have enough room to throw a frisbee, or your dog can’t run like he used it, but you can still roll a ball along the floor for your dog to fetch. Even if he can only walk slowly it will still be fun, and somewhat of an energy burner. Depending on your dog’s condition, he may be able to run or at least walk up all or a few stairs. Stand on the step he’s able to reach, throw his favourite toy to the bottom and have your dog bring it back up. After a few rounds he’ll be ready for a nap. The mental challenge of a puzzle toy is another great way to get a dog active. Whether you buy them or go the DIY route, they’re a lot of fun. Change them up every couple of days so he doesn’t get bored. Pinterest is a great resource for DIY puzzle toys. A treadmill is a great way to get your dog moving, it just may require a bit of training to teach him how to use it. Don’t have one? There are doggie versions on the market if you wanted to make the investment. Swimming is such great exercise for dogs of all mobility levels, simply do a search to find an indoor doggie pool in your area. Training is not only fun and an opportunity to bond, it also provides your dog with mental stimulation which helps work off energy and stave off boredom. Of course he’s already well trained, but there’s always something new he could learn. How about teaching him the names of some of his toys, then getting him to bring them to you!! I just mentioned teaching your dog names of toys, so why not also teach him names of certain household items, then get him to do some chores!! Teach him what a sock is, then get him to pick them up and bring them to you. Ask him to put the toys he knows the names of in the toy basket. Whether you or one of your kids hides and your dog has to seek, or you hide a bunch of yummy treats around the house he has to find, it will keep him busy, exercise his brain and even tire him out. Indoor dog parks are such a great idea, bringing the fun of the outdoors inside! I know we never need an excuse for this one, but if it’s been awhile and he’s stuck indoors, now is the time to buy him something new to peak his interest. Whether it’s a chew toy, a bone or a stuffed toy he can really sink his teeth into, it’s a fun way to burn calories and keep your dog busy. Flyball, agility, scent work or just fun and games, find some local classes and give them a try. You’re bound to find something your dog will love. At your place or theirs, getting together for a doggie play date is so fun for the pups, and their people!! I know whenever one of my dog’s friends comes over they run around like lunatics, then have to rest because they’re so tired out. 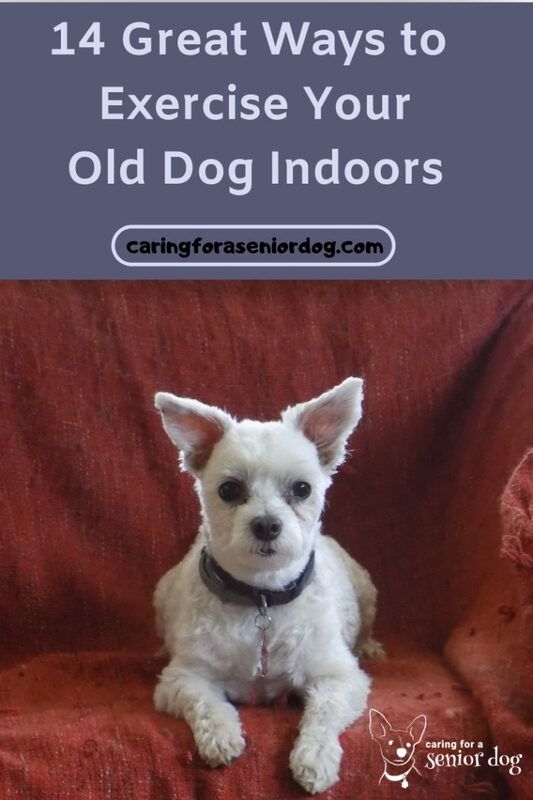 So there you have it, my 14 ways to exercise your old dog indoors. I love that there are so many options, suitable to all mobility levels. When you aren’t able to take your dog outside, what do you do to make sure he gets enough exercise and has fun at the same time? Really awesome ideas for keeping your dog entertained indoors! I am definitely going to try the obstacle course one with Navy. The weather has been so bad in the DC area lately, we are looking for new ways to keep her busy indoors. I love the obstacle course idea, and you don’t even need a lot of room to do it. Hope Navy enjoys it! Perfect timing that I’m seeing this today. It’s supposed to rain the next 9 days and I need to make sure my senior dog, Zephyr, gets some exercise. The stairs tip is a good one. All I’ll have to do is go upstairs and he’ll follow me. If I do that several times then it will be great for both of us. I’m glad there are so many fun ways to keep them active in the house so they don’t go stir crazy during the bad weather. Hope they got the forecast wrong! Great post! I have two dogs, a 10 year old and a 3 year old, and do a lot of these indoor activities with them usually when the weather isn’t great outside. Thanks! Your dogs must have so much fun, and it’s not weather dependent! Right now because of an ACL injury I’m trying to keep my little guy off the stairs – but he has other ideas. One of my favourite ways to exercise him is to take him to PetsMart and walk around and around. I know how hard it is to stop them from doing things they shouldn’t. My dog was paralysed suddenly and although he’s fine now after spinal surgery, he’s not supposed to jump but like your dog, he has other ideas!! Walking them in this big box stores is such a great way to give them more exercise, although Jack spends more time sniffing! 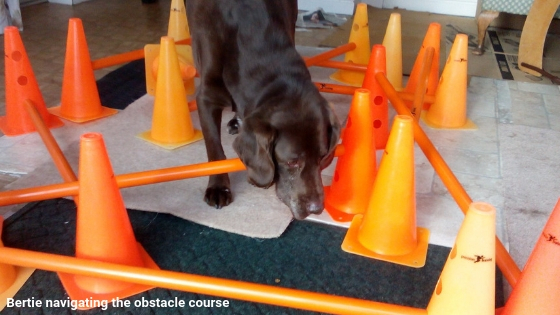 I really like the idea of the obstacle course, my dog loves agility games. I also buy her toys to stimulate her brain trying to find the treat. Thanks for all the suggestions we get heavy rain in Florida so this is helpful. So many great ways to keep them active indoors. We lived in South Florida for awhile so I know what you mean. These are excellent ideas. I enrolled my dog in a tricks training class and it was so much fun! Great Winter activity. Puzzle toys are also great for my dogs, they really enjoy it. That class sounds amazing, and definitely a great winter time activity. Love it! These are great ideas. I love the obstacle course idea and playing ball (slowly and gently) in the house. That’s awesome. Playdates are fun too. Absolutely, there are so many great ideas for dogs of all mobility issues. Great for cats as well! Great ideas especially for rainy days, I love walking Layla to the pet store on bad days, she hates the rain but one she gets there – two blocks away – she is showered with treats and comes home with a good bag. A win win for all of us. I am lucky she can run free in our building which is big with carpeted floors so many times she does the zoomies up and down the corridor which is fantastic exercise for her as I live in a tiny studio with very little space to run. That’s amazing you live so close, a great way to exercise on the bad days and a fun excursion for the dogs. I bet she has a blast running up and down the hallways, my cats used to do that when I lived in an apartment. One of them, Tyler, used to go to my neighbour and bang on her door until she let her in. It was the cutest thing. These are all great ideas. I would have never thought about a play date. I like that idea best. What better way to keep your pup active than with playing with friends. Activity and a mood booster! Will share. 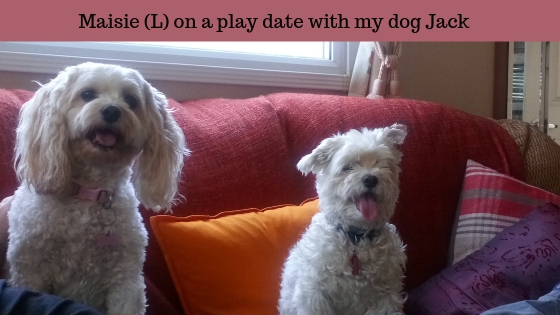 Play dates are fun, I know how much Jack loves to see Maisie. It’s also great for the humans to spend some time catching up! These are some great ideas! So often, people forget how powerful that mental workouts can be for our canine companions, not just as seniors, but at any age. Mental stimulation is just as important and tiring as physical activity! Thanks Debbie. You’re right, I can’t tell you how many times I’ve mentioned the words “mental stimulation” and people don’t have a clue what I’m talking about. These are such helpful tips, I have a senior dog so I totally appreciate these. Babu (riding on 15) will probably never help his mom around the house (haha) but he still enjoys going on hikes. Jack wouldn’t help me either…unless there’s cheese involved!! Glad to hear he’s still loving his hikes. Ah, yes, we had an obstacle course, balancing disc etc for Cookie’s rehab. We also used puzzle games and we played the game of finding treats hidden throughout the house. There are so many ways to keep a dog entertained and exercised indoors, no matter the weather. They’re really great I have to find one more challenging for my dog, or check Pinterest and make one myself. Jack loved the one I have but he figured it out in seconds. These are fantastic suggestions. Senior dogs require exercise, too. Our little Reese would happily play fetch but was not keen on a walk in the park. I’m sure she did more laps with fetch! Thank you! Senior dogs definitely need exercise, I just wish more people realised its importance. You have some ingenious ideas here! The assault course made me smile and I can see it would have huge benefits for a dog. Movement and motion are so important at any age. 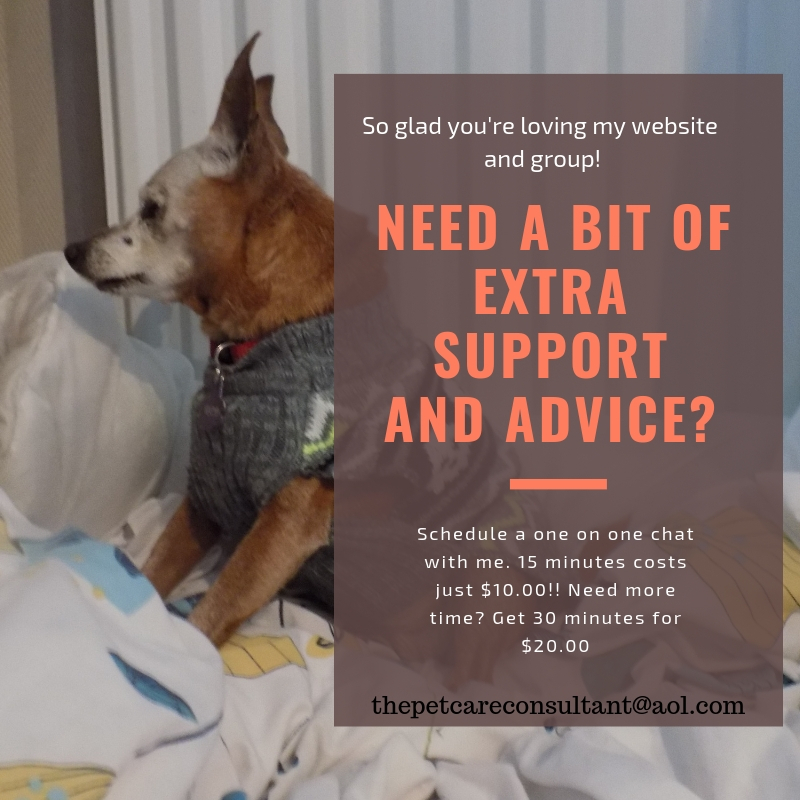 Playdates with senior dogs? My idea of fun, they can move slowly without needing to wait while a youngster rushes in and maybe knock them over! Thanks! It’s timely because so many places have horrendous weather and their dogs aren’t getting out. Having said that these ideas are great for any time of year, as a way to give our dogs (and cats) an opportunity to get even more active and prevent boredom. These are great ideas for dogs of all ages. Our winters are pretty cold and icy, so we prefer inside activities. 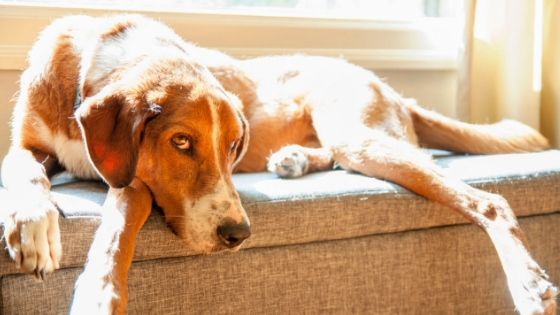 There really are so many ways to keep a dog from getting bored when they’re stuck inside. My Huskies love puzzles and my one, the oldest at almost 14, loves Fetch! All great ideas for easing the cooped-up winter blues! That’s good they have things to keep them busy. My dog is happier watching people walk by so he can bark at them because they’re too close to his territory! !